Founded in 1993, the Sinfonia has established itself as a leading chamber orchestra in the West Midlands. While performing under a professional conductor and leader, many of the players follow careers outside music. The Sinfonia enjoys close links with the City of Birmingham Symphony Orchestra, many of whose leading players have been eager to perform concertos with the Sinfonia. Traditionally, the orchestra receives enthusiastic support in Barnt Green, not least because a number of the players come from the surrounding area or have strong links with St Andrew’s. The conductor for this concert will be Mike Seal. While performing regularly with the CBSO as a violinist, in 2005 Mike became their first ever Assistant Conductor. Mike studied at the Conservatoire and became principal conductor of the Sinfonia of Birmingham in 2002. Tim Stidwill will perform York Bowen’s Concerto for Horn and String Orchestra in this concert. York Bowen was regarded as the “English Rachmaninov” and this luscious composition has a lyrical quality. Tim, who started playing the horn at age 11, has been a regular performer with the Sinfonia. 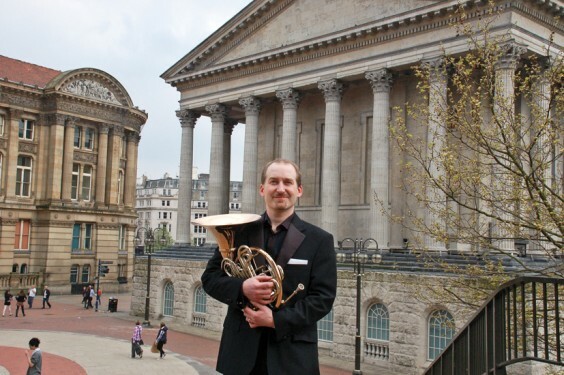 He is also a member of the Academy of St Philips and the Harborne Brass ensemble, has played for the Chandos Orchestra and Midland Philharmonic and is principal horn in the Birmingham Philharmonic Orchestra. The Barnt Green concert begins at 7.30, and features Mozart’s Symphony No. 36 (Linz), Delius’ On hearing the first cuckoo in Spring and Haydn’s Symphony No.104 (London). Admission is £10 (£8 for over 60s and £6 other concessions) and tickets can be obtained on the door or by ringing 0121 447 7671. This programme will also be performed on Sunday July 15 at St George and St Teresa’s church in Dorridge. Tickets are again available on the door or by ringing 0121 704 3454.